Using just 2 lengths of string, this article discusses the speed of intention and its apparently Faster Than Light speed properties – prepare to have your head twisted! Does anything travel faster than light? What about the speed of your consciousness? Greetings my time travelling friends! According to most scientific academics they can prove it does not, yet almost 100 years into quantum physics and science is little further forward in explaining some of the most common physical phenomenon in the universe. From gravity to time itself, the theories are thick and fast – some thicker than others! OK, I promised to bend your head, so here goes. Take 2 lengths of string one short and one long. I suggest 1 at least 20 times longer that the other! Next arrange yourself in a clear safe area. 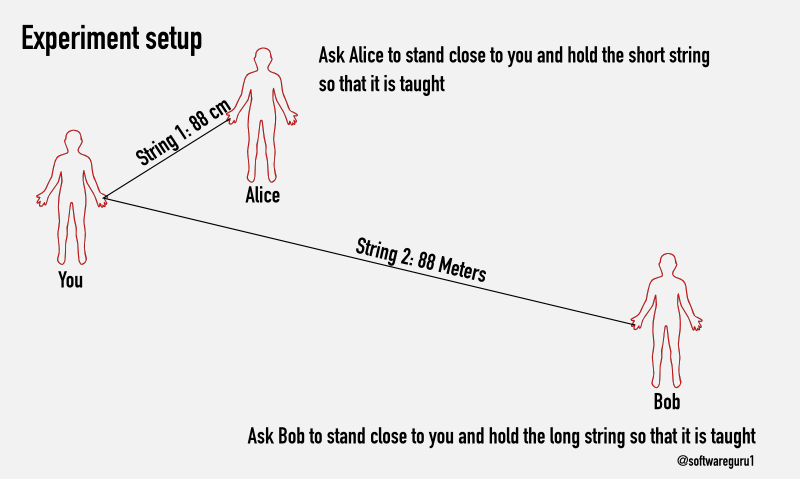 Holding both strings in one hand, ask Alice to hold the short string and Bob to hold the long string and instruct both to move away from you until the strings are tight. Next instruct both your friends that you will shortly pull the string and when they feel it tug instruct them to shout out “WHAT DID I TELL YOU.....88 MILES PER HOUR!! !” - you could also substitute shouting for synchronised stop watches if you are really techie! Then without warning tug the string firmly. Bingo! Welcome to the future (or past). Something magic happened. You transmitted your thoughts and intentions to two points in two different futures! How you ask??? OK, this experiment is really about demonstrating a little quantum conundrum. You have heard of quantum entanglement yeah? That weird thing that says two particles can be connected across vast distances yet act simultaneously as one thing? Im assuming you have and if not go google that mother and come back. So, when you pulled the string, your brain signalled your intentions , relayed that to the hand and therefore the string. This all happened in about 1/3 of a second … but at the point your intention left your hand and went onto the strings it was separated onto two virtual timelines that simultaneously exist in your own. Both Alice and Bob shouted “WHAT DID I TELL YOU.....88 MILES PER HOUR!! !” at exactly the same time (assuming they have similar reflexes) and so, despite the fact that Bob is way more distant from you, he got the intention at “exactly” the same time! How the holy hell can that be? Well, of course the string is for most purposes a “solid” pull one end and the other moves instantly. Now... and this is the head wrecking part.. that string is really made of atoms. Those atoms are just energy all tangled up. Some believe its not really a string at all but just lots of energy that is attracted into a stable shape by quantum forces. So, what we are showing with this experiment is that the speed of intention through a solid can move faster than … well, anything really! Truth is you didn't, because if Bob hadn't been told first to shout out, he would have looked blankly at the string. This shows that “no information” but only “intent” travelled the distance without prior agreement on the meaning. A huge quest is to try and discover and understand what forces can behave like this in the world around us .. and more importantly how we can use them to do cool stuff. The most fascinating discovery from this experiment is this:- No matter how long you make string 2, even if you made it 1,000,000 miles long, Bob would get the tug at exactly the same time as Alice. So if time to Bob TB=0 and time to Alice TA=0 then TA=TB and so T=0 which means that despite the fact that the atomic structure of the string is limited to the speed of light, the intention moving through it TI was faster. Therefore TI < T.
Hope you enjoy your Time Machine... If you manage to build this highly complex machine and test it at great distances, tweet me how far using the hashtag #ibuiltscotstimemachine and the distance in metres.